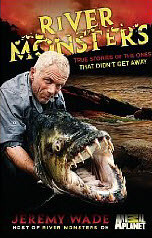 After watching every episode of River Monsters with Jeremy Wade, it was actually enjoyable to read the back stories to all of his adventures. I think I have watched every episode at least twice including all of the unhooked episodes where they insert popups that give additional info about what is going on.This book actually took a bit longer to read than expected. I started it weeks ago, but with all the scientific prose, history and stories within the story, I really wanted to take my time.Since I started out with a bit of knowledge about what he's done by watching the show, it was exciting for me to actually read the various chapters that filled in the additional details. I must admit, he's a very brave man considering everything that he's been through...surviving a plane crash, contracting maleria and being arrested as a spy. Not to mention, travel to all of those places that I don't have on my radar as places I want to visit! The book includes a pictorial from his adventures. Considering the fact that his subject would normally be something I wouldn't consider reading, I am pleasantly surprised at how much I enjoyed the book. After having watched the show, I am even more impressed with his expertise and knowledge on the areas he has traveled. You can definitely tell he has done his homework. But after doing this for over 25 years, who wouldn't?